Hollyhock symbolism and meaning have an ancient pedigree, as they do for healing. Hollyhocks are symbolic of the cycle of life, and so you find them i funeral practices of the ancients, as well as fertility. You’re hard pressed to find a malevolent use for the plant. Bees and butterflies are attracted to the pollen which drips onto the petals, spreading fertility to the witch’s garden. 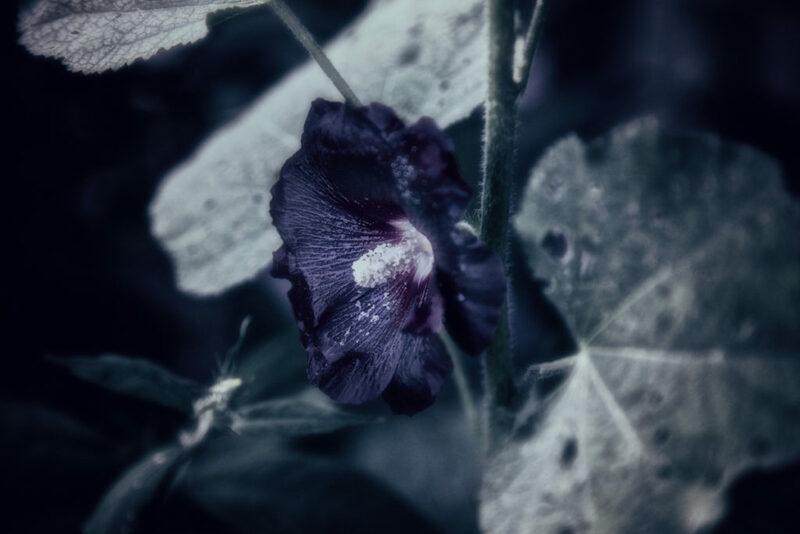 The name Alcea comes from the ancient Greek word for healing, altho, hence the translation in some quarters to Althea. 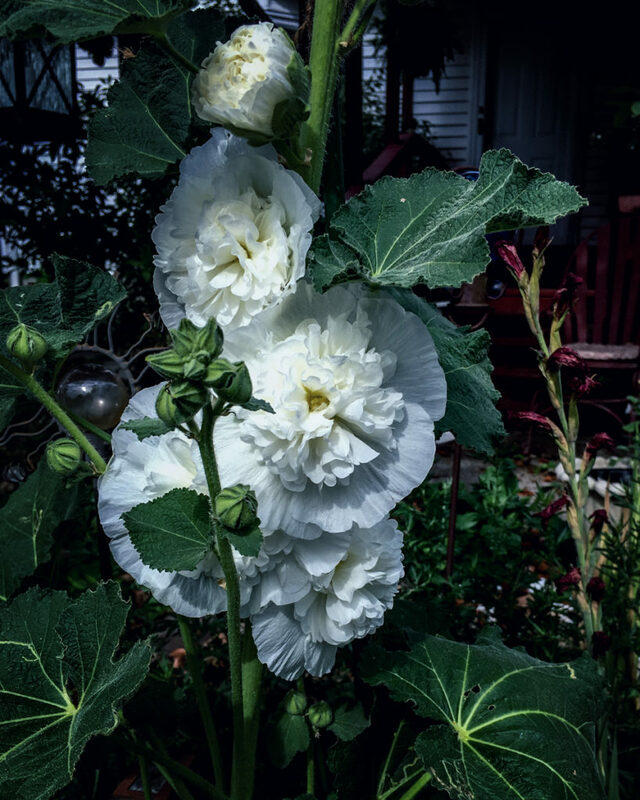 It’s a form of wild marshmallow, from which it draws its Christian name of Hollyhock, meaning holy hoc, with hoc being an alternate word for mallow. 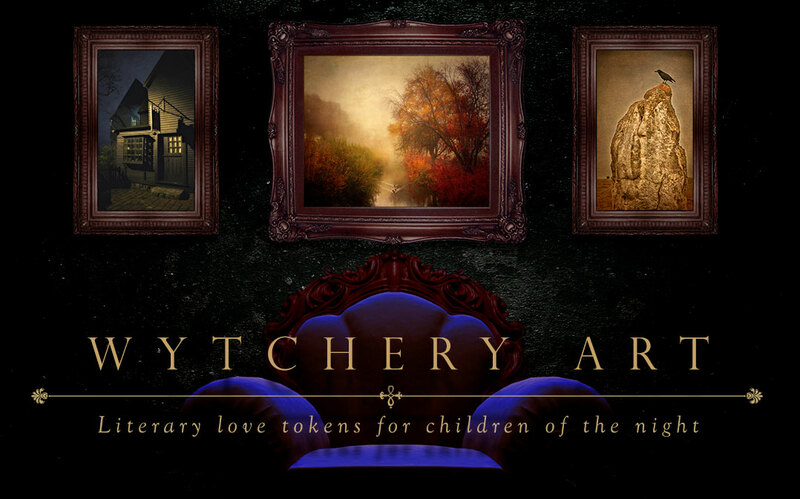 Hollyhock symbolism extend to the realm of Faery, as fairies were believed to use the blooms as skirts, and Hollyhock seedpods were known as fairy cheese because they resembled a cheese wheel. There is even a recipe dating from 1660 that recommends combining Hollyhock, Marigolds, Wild Thyme and Hazel buds in order to allow mortals to see the fairy folk. The oldest reference to Hollyhock symbolism dates from a discovery in 1957-61 at Shanidar Cave in Iraq, excavations uncovered nine Neanderthal skeletons, likely 60-80,000 years old. The last one found showed signs of relatively elaborate funeral preparations, with pollen indicating that the body had been buried with certain plants, hollyhock included. But in fairness it should be noted, that it’s thought likely that the pollen was introduced after burial by burrowing rodents. What is known for certain however, is that the ancient Egyptians made wreaths of Hollyhock which were buried with mummies, indicating that in that culture, the plant had connotations with the circle of life, leading the dead into their new lives. It wasn’t uncommon even in the modern era to find Hollyhocks grown in graveyards, particularly along fences and gates. In pagan and Wiccan circles, Hollyhock symbolism is associated with Lammas because of its tendency to reproduce in abundance. 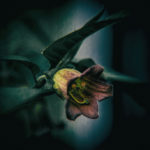 They are frequently used in rituals involving requests for abundance, due to Hollyhocks symbolism of growth and rebirth. In fact, it is said that one reason why it used to be grown so close to English cottages was to promote abundance in the household, both in power and wealth, but also in fertility. At the end of a Hollyhock’s cycle, it reseeds itself in abundance, ensuring the next generation. It’s also worth noting that in the Victorian era, Hollyhocks were grown next or even obscuring the privy. In that fashion, a lady wouldn’t have to ask where it was, but could simply look for the Hollyhocks. During the Tudor era, Hollyhocks were used to prevent miscarriages, by steeping the blooms in wine. 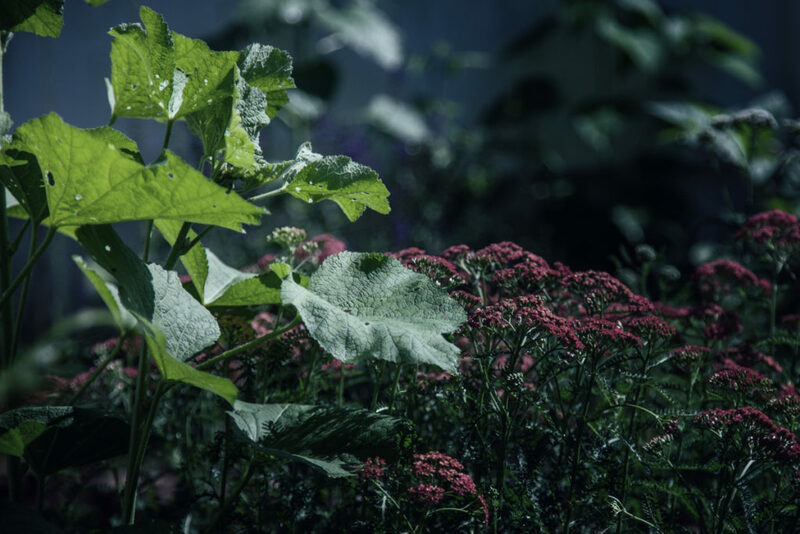 Difficult labors were soothed by ingesting Hollyhock shoots, and continuing with the rebirth theme, babies used to chew on them to sooth the teething process. Hollyhocks were also used for a plethora of medicinal uses. In the middle ages, a tea made from Hollyhocks was used to fight lung and bladder disease. 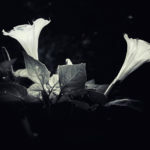 It’s still believed that the plant is useful for those purposes, as well as treating constipation, ulcers and inflammation of the skin (Hollyhock is a frequent ingredient in skin lotions), and bleeding. It is also thought that Hollyhocks can be used to break up and help pass kidney stones. 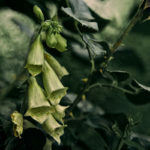 In addition to funerary rites, the ancient Egyptians, as well as Romans used to eat the roots, which is rich in sugars, boiling it as well as frying it. In the 1800s, Hollyhock sap was whipped, sugar added and then poured into molds and sold as candy. The Hollyhock likely came to Europe from the Middle East by crusaders returning from the holy wars, around the year 1500, and quickly became a staple of medieval gardens. The black version, similar if not identical to the ones grown by Thomas Jefferson at Monticello were known in Europe by 1629. Eventually Hollyhocks became well known as a staple of the English cottage gardens, as their overwhelming height made a bold statement, along with their expansive blooms. 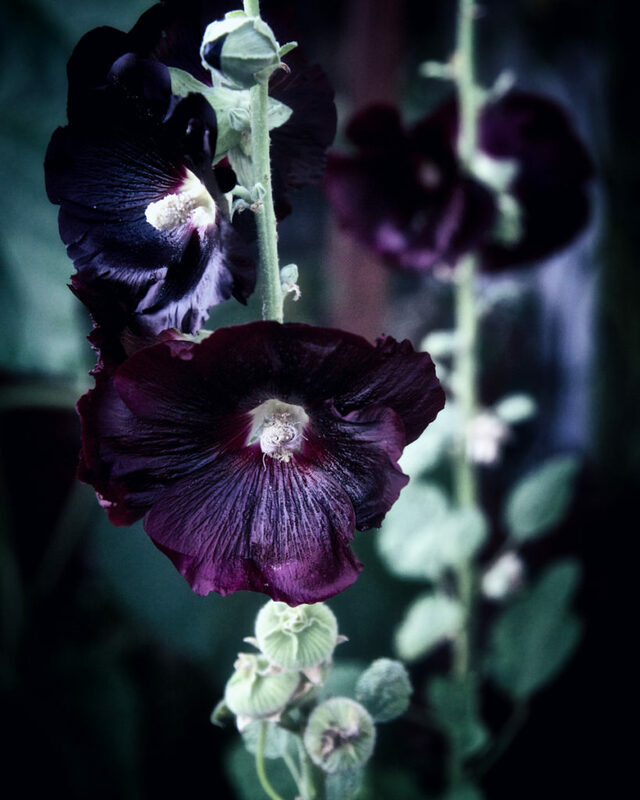 Hollyhocks grow in a variety of colors, though for a witch’s garden perhaps the most appropriate is the darkest variety, a deep scarlet or purple which is almost black. 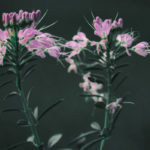 The stalks can grow up to eight foot tall, are considered small at five foot, and as the plant can look a bit ratty after it’s finished blooming, it’s frequently grown against houses or walls, in the back of the garden. It’s advisable to keep a close eye that as they grow taller they don’t begin to topple over, and if it looks to be the case, staking is in order. Hollyhocks are typically sewn directly by seed into rich soil, when temperatures are just below seventy degrees, and ideally when you have enough rain to keep the ground soft. Sunny sites are great, but because of their height, a sheltered spot from the wind is favored. The first year is spent growing roots and it will likely produce a rosette, before shooting up a magnificent spike the second year. Hollyhock is a relatively short lived perennial, with a life span of two to five yard. However, it’s quite adept at self-seeding, so once planted, unless you cut it down in early autumn before it goes to seed, you shouldn’t have a shortage of Hollyhocks. Mulching will protect the plant during winter, and it will actually begin to drop leaves in order to survive, and is known from time to time to bloom during a mild season.